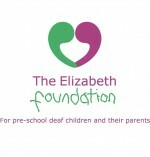 The Elizabeth Foundation helps young deaf children learn to listen and speak. We support early diagnosis for babies, toddlers and pre-school children with permanent hearing loss, and provide health, education and welfare services to them and their families. We enable profoundly deaf children to develop their listening skills and natural speech so that they can join mainstream school at age 5 ready and able to learn alongside hearing peers. First class education for vulnerable children who are deaf aged 0 – 5 who would otherwise be isolated from early years education and language development. Speech and language therapy – tailored to the individual needs of each child. Audiological services – including early intervention and provision of guidance on the regular use/maintenance of hearing aid equipment and information on cochlear implants. Parent and family support – guiding families through their sense of loss and fear and raising expectations for their deaf child’s future. Included within this is informal counselling for parents, which is particularly important when babies are first diagnosed, typically between 2-6 weeks old, which often comes as a real shock to new parents.